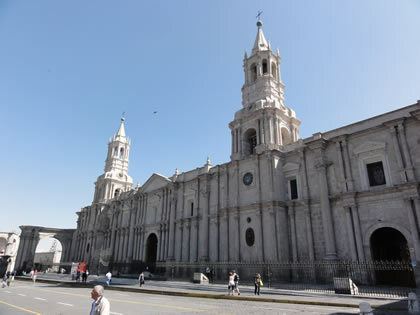 The Catedral of the Arequipa is considered one of the first religious centers of the XVII century. It was built out of ashlar (a stone of volcanic origin ) with brick vaults. 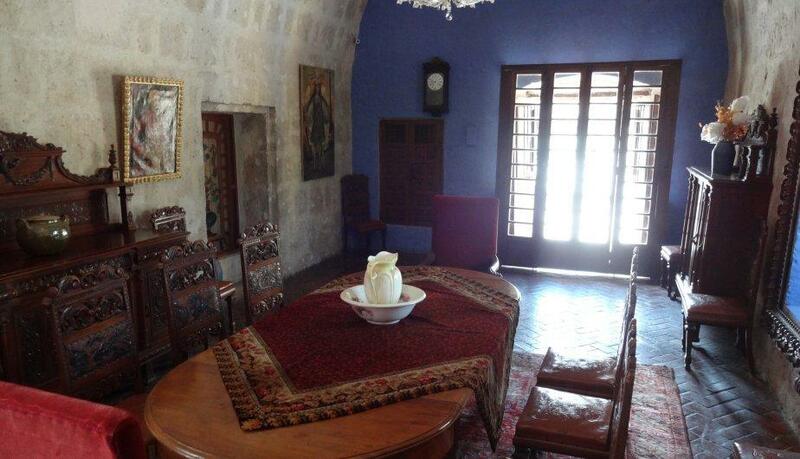 It was badly damaged by a fire in 1844 and was rebuilt in 1868 by the arequipenian Lucas Poblete. It was built in neoclassic style with the entrances to the temple situated in the lateral naves. It was later damaged in the earthquake of 2001 in which its towers were largely affected. 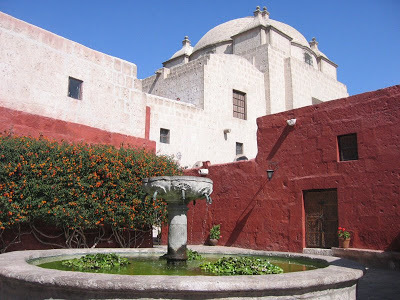 The Santa Catalina Monastery was built to lodge the daughters of the most distinguished families in the city. The monastery was open on October 2,1580 under the invocation of Saint Catherine of Siena as a center to live in absolute retirement and remained that way until August 15, 1970. 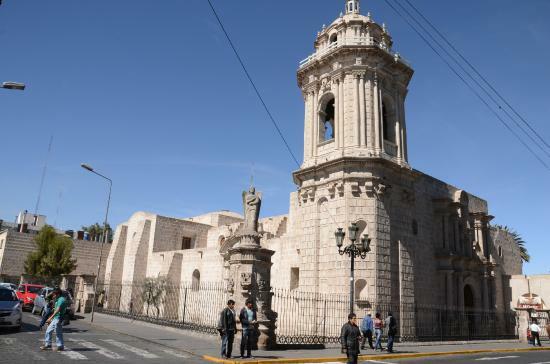 The Santa Catalina convent occupies an area of about 20,000 sq meters, divided into streets replicating the first streets of Arequipa city. It contains a variety of architectural spaces including a pinacoteca to exhibit paintings of the Cuzco and Quito School. There are many other halls and spaces to visit such as the porter cloister, the precolombina Museum, the San Francisco cloister, the amazonic museum, and many others. 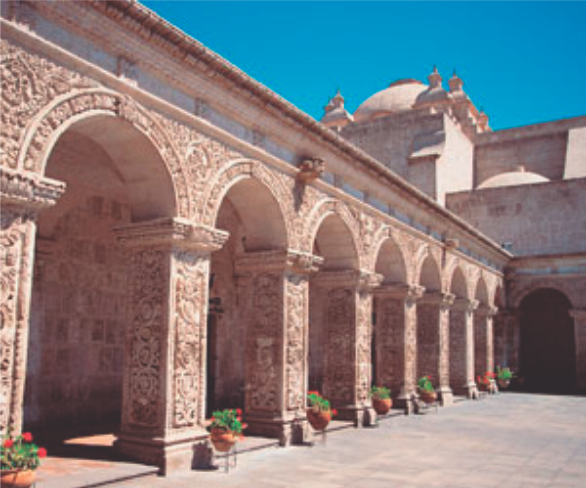 Comprised of various buildings built by Jesuit Monks, the Church was designed in 1573 by Gaspar Baez to serve as living quarters for the monks and resembles religious architecture of the XVII century. The original structure collapsed in the earthquake of 1584 and was rebuilt in the 1650s. The Complex is comprised of the Franciscan Church, the convent, and a small temple known as the third order in its interior. Within the church excel the baroque pulpit decorated with shortened reliefs and the silver frontal place of the major altar. 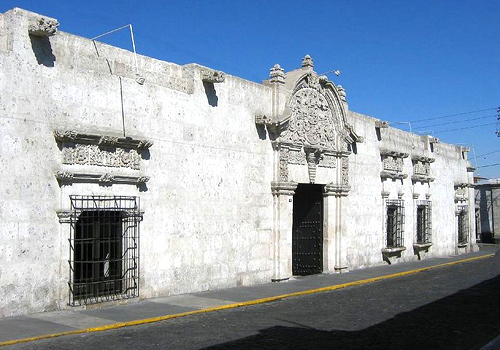 Besides of this the alley,that did serve as división between the women prison, was integrated to the complex: it was transformed into a gallery for crafts exposition and is web known as the "Fundo el fierro". Jr. Recoleta 117. tel: (054) 27-0966 visits: mon-sat 9:00-12:00 and 15:00-17:00 Franciscan convent founded in 1648 , was open to the public just in 1978. It presents styles that vary from the romanic to the neo-gothic, that is due to its many reconstructions ( the last one dates back to 1940 ). The convent comprises four cloisters and four scpaces . There are there three museums : the Archaeological and Anthropoligical Museum, the Natural History Museum and the Religious Art Museum. 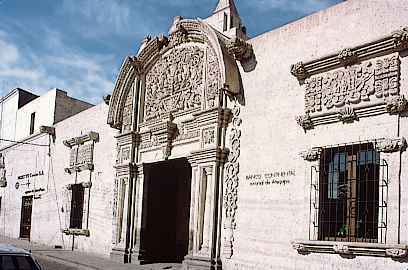 It counts also on a pincoteca with paintings of the Arequipenian and Cuzquenian schools and a valuable library with about 20 thousand volumes, maps and very ancient documents. Cross of Santo Domingo and Rivero Streets. tel. (054) 21-3511 / 21-350 visits: mon-fri 7:00-12:00 and 15:00-19:30. sat 7:00-9:00 and 15:00-19:30. sun 5:30-12:30This Church is carachterized architechtonically by its bell tower, its vestibule with cornered pedestal and its impecable arc underneath the choir. In its interior we can appreciate imagery pieces and paintings with sacred motifs. 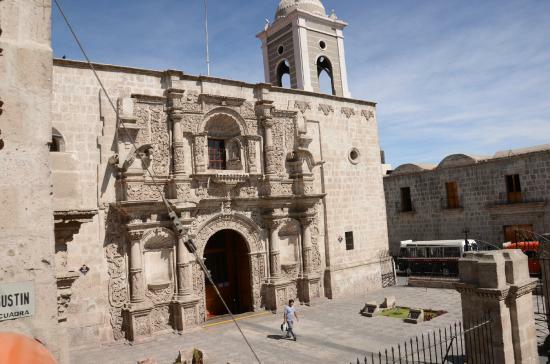 The lateral frontispiece is also web known for being the most ancient in Arequipa city. The Major cloister of the convent was built around 1734. Intersection between San Agustín and Bolivar Streets. tel: (054) 22-0066 visits: mon-sun 08:00-12:30 and 17:00-20:00 built in 1575, it has a facade that dates back to the first half of the XVIII century and is considered one of the best in its epoque. Architechtonically talking it belongs to the meztizo baroque with a predominance of the use of the ashlar ( sillar ) in its construction. In the inner part of the temple excel the cupola, the neoclassical altars and specially the major altar by its careful done carvings and its golden laminae works. Intersectoion between La Merced and Tristán Streets. tel: (054) 28-2015 visits: mon-sun 07:00-08:30 and 17:00-18:00 Its construction begun in 1551 and was concluded in 1607. It has an attractive lateral frontispiece in which outstands the image of the Mercedes Virgin accompanied by two mercedary Saints. In its interior we can find many important art workds such us : " The appearance of the Virgin to Saint Pedro Nolasco" and some series of paintings on the Merced Virgin . 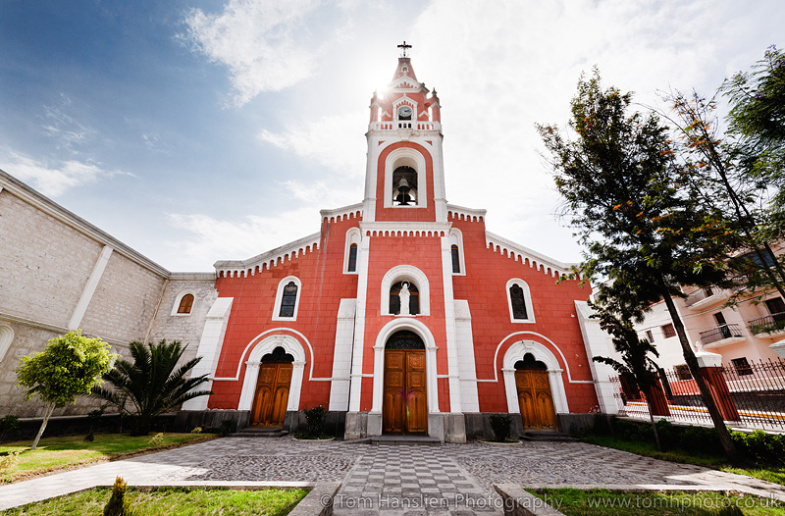 Both the Church and the Convent, tihis last being the second built in the city wer built up using arequipenian ashlar . The cloister keeps a library that dates back to the epoque of the viceroyalty. At 9 km from the Arequipa City (15 mins by car approx.) built in ashlar in the border of a cliff is one of the most traditional and important of the department. 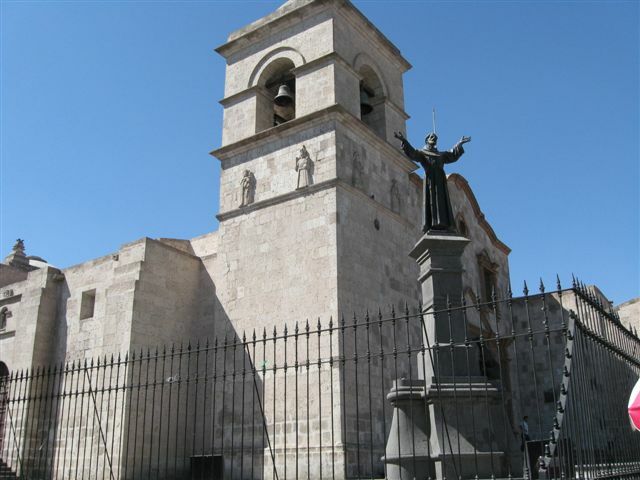 According to the legend Garci Manuel de Carvajal , the founder of Arequipa city , commanded its construction for his son. Later on , in 1785, Don Juan Crisóstomo de Goyeneche y Aguerreverre became its owner and remodeled it giging to it its particular señorial characteristics. The principal entrance comprises a vestibule with vaulted ceiling,and continues in a broad main courtyard to which give the windows and the rooms. San Francisco Street 108. tel: (054) 21-2209 visits: mon-fri 9:00-13:00 and 15:45-18:00: sat :09:00-13:00 It has a very traditional Façade and courtyard. It is nowadays the seat of the numismatic museum and an art gallery that are kept by the continental bank. Owner of the mansion. 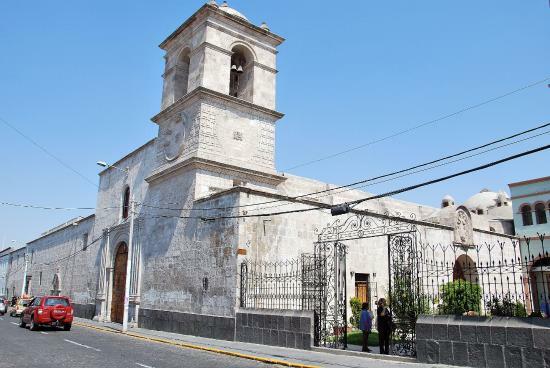 Moral Street 318, cercado visits: mon-fri 9:00-17:00 and sun-holidays 9:00-13:00 Mansion of the XVII century , it is one of the most antique and important architechtonic monuments in the barroco style in Arequipa city.The mansión owes its name to an old moors tree that grows in its main courtyard. The frontispiece in ashlar stone (sillar), constitutes an art work in which one can apréciate carefully carved figures such us : A crown held by two angels on a shield, at the same time the shield has on it a casttle, a bird a puma and two crossed keys.